Centacare is commited to walking in partnership with all Aboriginal and Torres Strait Islander peoples, in the spirit of Reconciliation and mutual respect. We receive valuable insight from John Lochowiak, Manager of Aboriginal Services, and the Aboriginal Leadership Committee. Through the committee and informed by our RAP, we work in partnership with Aboriginal and Torres Strait Islander people to deliver culturally inclusive strategies, events and policies for clients and staff. John Lochowiak will lead the National Aboriginal and Torres Strait Islander Catholic Council (NATSICC) for another three years. Manager of Aboriginal Services at Centacare, John was recently re-elected NATSICC chairperson at a council meeting in Melbourne. His inaugural term leading the Council saw John oversee the development and roll out of the first Bishops-approved Aboriginal and Torres Strait Islander acknowledgement plaques. Today, these are a bold statement of support and a physical sign of welcome and understanding at parishes, schools and other organisations around Australia. In addition, John led an Assembly which brought together more than 300 Aboriginal and Torres Strait Islander Catholics to discuss their faith and spirituality in Perth.He is one of 13 people appointed to the 2020 Plenary Council to steer dialogue about the future of the Catholic Church in Australia. NATSICC represents over 130,000 Aboriginal and Torres Strait Islander Catholics. John will now guide the delivery of NATSICC’s 2019-2021 Strategic Plan. Empowering NATSICC and communities: The strength of NATSICC lies in the ministries that serve communities. Strategies have been put in place to provide funding and capacity building for these ministries and communities. Empowering young people through a renewed focus on strengthening the faith and leadership capacity of young Aboriginal and Torres Strait Islander Catholic leaders to become positive roles models. Meeting the needs of the community: By developing and delivering locally designed projects, NATSICC will assist in proving tangible assistance to Aboriginal and Torres Strait Islander people. NATSICC is the peak advisory body to the Australian Catholic Bishops Conference. Little hands glue coloured sticks onto paper fish to tell the Ngarrindjeri dreaming story of the thukeri (bony bream). “It teaches us not to be greedy and to share,’’ explains Rosslyn Richards of the story, at a playgroup to help Aboriginal children reconnect to culture. Every Tuesday, Ros and fellow family practitioner Natasha Sumner take Centacare’s Po:rlar Ka:ngkun Tainkuwalun (PKT) Journey to Learning program on the road, from Murray Bridge to the Goolwa Children’s Centre. In a first for the Fleurieu Peninsula, the playgroup is bringing Aboriginal families together to learn their language, play, and make new friends. Craft, dreamtime stories, and water and nature play feature, as children aged 0 to 6 engage in fun activities to prepare them for kindy and school. For many families, the playgroup is a vital connection to their cultural heritage, especially language. 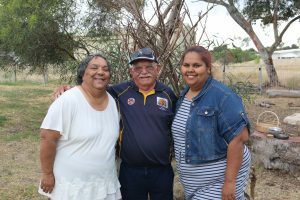 “It’s often when the kids get to high school that they think `we should have learnt this more often’,’’ says Uncle Archie, a Ngarrindjeri Elder. The playgroup is part of a wider push across the Fleurieu to recognise Aboriginal language, history and culture. Local schools are leading the way, including Goolwa Primary. Deputy Principal Kym Palka integrates students from Reception to Year 3 in the playgroup each week. “It gives them the opportunity to meet with the Elders, to do a bit of bonding, arts and crafts, and connects them with Aboriginal culture,’’ he says. For others, the playgroup is a chance to see extended family. “I love coming here, not only for the kids to interact with each other but for us as well. It’s a good time for all of us to catch-up,’’ says a grandmother who brings her grandson each week. Cultural awareness is a priority at Centacare and is guided by the wisdom and knowledge of our Aboriginal Services Manager, John Lochowiak. John joined Assistant Director Pauline Connelly in Mount Gambier last week to deliver cultural awareness training to 20 staff working across programs in the South East. Local elder Aunty Penny Bonney performed a Welcome to Country in Boandik language and spoke about the tradition’s cultural history, significance, meaning and importance. A Welcome to Country is where a Aboriginal or Torres Strait Islander traditional owner, custodian or Elder welcomes people to their land through a speech, song, ceremony or a combination of these things. A new mobile playgroup in Strathalbyn is putting Aboriginal children on a journey to learning. Run by Centacare, the Po:rlar Ka:ngkun Tainkuwalun (Children Laughing and Playing) program aims to prepare children aged 0 to 6 years for kindy and school by engaging them in fun learning activities and outdoor play. Outreach, early intervention and one-on-one support is also provided to families experiencing challenges that may put children at risk of disengaging from early education. “They might have health or housing difficulties, or other siblings might be struggling which brings pressure into the home and prevents the younger children from getting a good start,’’ Family Practitioner Lyall Willis said. “It’s about engaging pre-school age kids with activities that are fun and culturally appropriate but also are stepping stones into further learning. “The emphasis is on showing them that learning is actually a fun thing to do and, that by gaining knowledge, you gain some control over your life. “We encourage parents to get involved too, so that they’re not isolated from their child’s learning but feel as though they have a say and a place in that journey, now and in the future. The playgroup operates every Thursday from 10.30am out of the historic Red Hen train carriage next to Station Master’s Gallery, South Tce, Strathalbyn. On Mondays the playgroup travels to Meningie Area School, North Tce, Meningie, from 10am to 12pm, and to Raukkan next to Moorundi from 12.3o-1.30pm. Nature play is nurtured through monthly bush and scrub playgroups in each region, such as Rocky Gully, Murray Bridge, and Bonney Reserve, Meningie. “When you watch children engaging in a normal playgroup environment with toys, textas and crafts, you can make assumptions about who they are and their ability. But when you see them out in the scrub, playing with the feathers and grasses and whatever else we might collect, a whole new character comes out. Family Practitioner Rosslyn Richards said the program plays an especially important role for Aboriginal children in foster care because it keeps them connected to their culture. It also helps break down stigma and shame, felt by some young parents. “We support them any way we can,’’ she said. *For more information about Po:rlar Ka:ngkun Tainkuwalun (Children Laughing and Playing), please phone Rosslyn Richards and Lyall Willis on 08 8215 6320. The Aboriginal Leadership Committee has met for the first time this year, with a focus on increasing cultural awareness at home and in the workplace. Highlighting the recent community healing event in Veale Gardens, ALC member Lyn Niemz said Australians have a greater understanding of the Stolen Generations’ despair because of Kevin Rudd’s historic Apology. 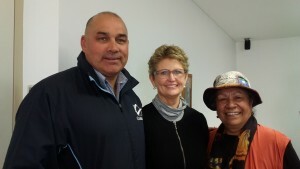 Speaking at the meeting, Lyn said she was encouraged to see increasing numbers of non-Aboriginal people taking part in events to mark the ninth anniversary of the Apology on February 13. The annual Reconciliation SA breakfast at the Adelaide Convention Centre drew more than 1000 people, including Centacare staff. 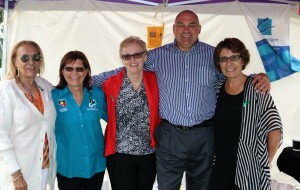 “It makes you feel like we are starting to get really get somewhere and that reconciliation is happening,’’ Lyn said. ALC chair John Lochowiak said it was important the nation kept acknowledging important dates and anniversaries in order to spread the reconciliation message. Cultural training in the workplace was also pivotal, said John. As part of this, the ALC will recommend cultural training for all foster carers involved in Centacare programs to “open people’s minds’’ and the way for them to care for Aboriginal children. 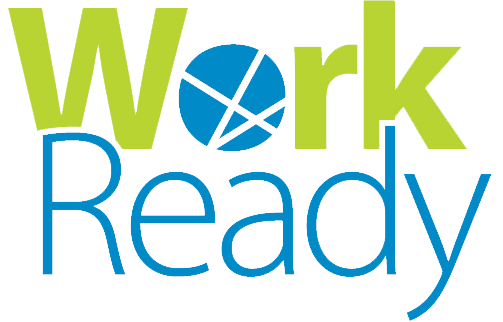 A strategy to increase the number of Aboriginal workers across our organisation will also be prepared. Centacare will promote inclusivity and cultural understanding as part of Harmony Day on March 21. 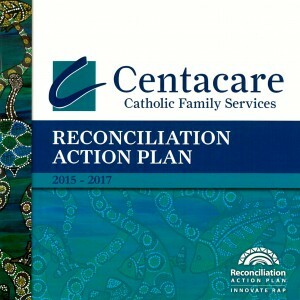 Centacare has launched its Reconciliation Action Plan with a focus on cultural diversity and mutual respect. We believe reconciliation should be a personal and value-based experience of all Australians, as we move towards respect for the lands, culture, heritage, languages and each other. The RAP encourages us to celebrate and embrace our cultural diversity by relating to one another through our similarities and talking openly about our differences. The front cover painting is by Ngarrindjeri artists and Centacare workers, Rosslyn Richards, Natasha Sumner, Lyn Lovegrove Niemz, and participants of the 2014 Family Relationships Services Australia Conference in Adelaide. The artwork represents Ngarrindjeri fresh water source, the River Murray, Coorong. Endorsed by Reconciliation Australia, the RAP was launched at Centacare’s service Expo, held at Morphettville Racecourse, on July 13. A charcoal portrait of acclaimed Aboriginal singer-songwriter, Archie Roach, by Ngarrindjeri artist, Damien Shen, was also installed at the event. Centacare purchased the drawing by silent auction at the National Reconciliation Week breakfast earlier this year, with proceeds of the sale donated to the Stolen Generations. “Centacare is truly committed to reconciliation and I am very happy to launch our RAP and install this sketching which holds special meaning to us here,” Director Dale West said at the Expo. Centacare receives valuable insight from the Manager of Aboriginal Services, John Lochowiak, and the Aboriginal Leadership Committee (ALC). We have enormous respect for the contributions Aboriginal people make to our community. The Centacare Aboriginal Worker Support Policy is regularly reviewed to ensure content is culturally relevant and effective in guiding our approach to the recruitment of staff and supporting their wellbeing. Cultural protocols provide guidance for workers in developing respectful relations with Aboriginal and Torres Strait colleagues and clients. All staff members undergo compulsory Aboriginal Cultural Awareness training. Reconciliation statements are displayed in all our sites. Smoking ceremonies and Aboriginal performing artists are included in official openings and celebrations on Traditional Lands.